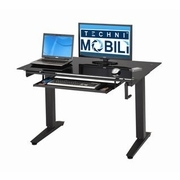 The Alto2 Glass Sit To Stand Workstation features a smooth manual height adjustable mechanism with a retractable handle which lowers and raises the table top from 28" H - 48" H. The top can be raised or lowered from its lowest to highest and down to its lowest positions within 30 seconds or 38 handle turns. The desktop is made of an 8mm black tinted tempered glass surface that sits on a heavy duty powder coated 2-stage steel frame. The Alto2 glass workstation includes a large pull-out keyboard with side storage and a table top cord management opening.